I’ve always fancied catching scallops. Back in the day, before commercial trawling, my dad and his pal Bill used to dive for them in sandy bays all along the west coast. Wearing home-made wetsuits and weight belts, snorkels and masks, they were – so the stories go – pretty successful at it, coming home with bucket loads clacking like castanets in the back of the car. Heading over to White Bay. It's the little strip of white in the distance. 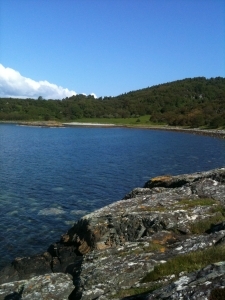 Inspired by these tales, one sunny morning last week I set off to White Bay with my swimmers and snorkelling mask to try and snare a scallop or two. At high tide the bay doesn’t look like much – just a small crescent with a fringe of dried seaweed – but it’s a great swimming spot. The clear water warms up nicely as it washes in over the sand. I waded out to the small island that sits at one side of the bay. Swaying seaweed licked my legs, tiny fish darted into the shadows and empty mussel shells, midnight-blue and pearl, shimmered in shafts of sunlight. The rocks on the island are sharp and black and wink with mica. I clambered over them to reach a smooth, flat slab. From here I planned to launch myself into the deeper waters where, I thought, scallops might lurk. I screamed like the gulls as I hit the glinting iciness. It was, of course, far too cold to stay in long. I gave the seabed a speedy scan before dragging myself out, dripping and shivering. The scallops will have to wait until I’ve invested in a wetsuit. 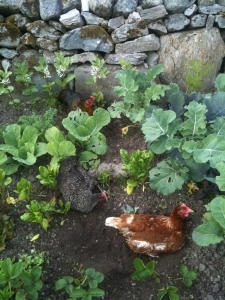 The pesky hens are caught raiding the veg patch. 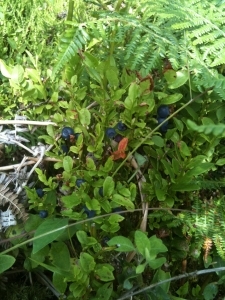 Still, I haven’t been short of delicious food to eat, and most of it’s been grown, foraged or caught locally. The mackerel shoals have well and truly arrived, and if you know the right spots to fish you’re pretty much guaranteed a catch. If truth be told, I’m a bit bored of eating grilled mackerel, so it was quite a treat when my neighbour dropped off four freshly smoked fillets the other morning. Still hot from the smoker, they oozed an oily, oaky, smoky, fishy, salty loveliness. I guzzled all of them for breakfast. A few days later his wife arrived at the back door with some hot-smoked salmon fillets, which were, quite possibly, the most delicious thing I’ve ever eaten. My next mission is to buy (or build?) a smoker. I’ve also been feasting on big brown crabs. I’ve become quite an expert at picking the meat. I eat it clean, sweet and simple on toast or make a pasta sauce with butter, chilli, basil and lemon. Blaeberrries in the woods. You need to lift up the leaves of the bush to spot them. And if all that sounds a bit protein-heavy, don’t worry. My vegetable patch is on the cusp of feeding me (as long as the hens don’t trash it) and there’s plenty of wild fruit to be found. Yesterday I collected a punnet of blaeberries from the woods; they were small and sweet and so much tastier than their flabby supermarket cousins. I’ve also been experimenting with edible flowers. The elderflowers are just about to go over and off, and I’ve been roaming the countryside furtively collecting the final few frothy white blooms. I’ve made elderflower champagne (six bottles that should be ready for Christmas), cordial and flatbread. The flatbread, with its hint of hedgerow, was a roaring success, and I finally had something nice to give to my generous neighbours. The pale-yellow cordial, decanted into small diet coke bottles, wasn’t quite so well received. It looked, rather unfortunately, like I was delivering urine samples to the village.